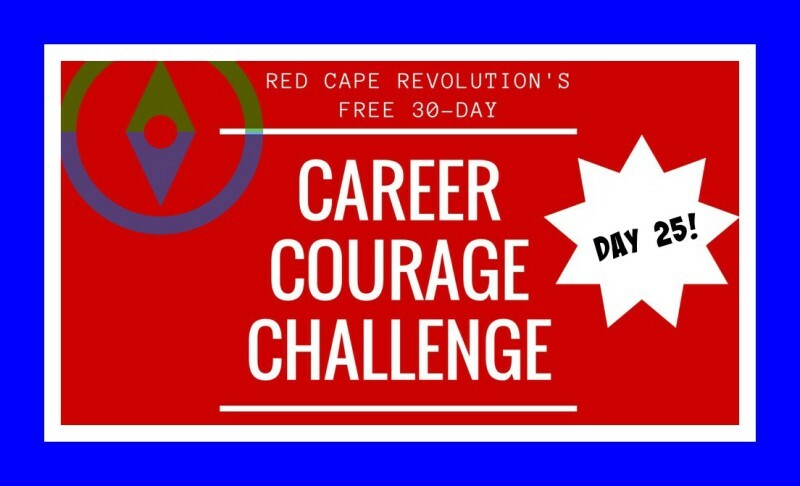 It’s the 25th day of our Career Courage Challenge! Really push yourself as we round the corner toward the end of this amazing month! Tell us about it, too–you can email us or write in the Comments at the end of this article, or on Facebook and LinkedIn, too. I’ve been taking the challenges along with you–read my notes in each day’s Comments. Let’s have some fun today. While yesterday’s challenge may have made you uncomfortable (and remember, that’s where the growth is), today, let’s surprise people with our gifts. And we don’t have to give STUFF. We can give our opinion. Our time. Our hands. Our heart. Think about what might be surprising for your favorite colleague, family member, or loyal friend. Or who might be surprised to get something from you, like an assistant, former boss, or old college chum. Somehow, we often find it easier to give things than to ask for them. Giving sometimes makes us afraid that our gifts will be rejected, unwelcome, unwise. But you don’t have to feel that way. Build your courage today by giving something surprising, unexpected, and ultimately, something uniquely you. Watch my short video for more ideas here (1 min, 48 sec). Today, a friend is struggling. My heart goes out to her. But what I’m deciding to give that will be surprising is my total faith in her ability to figure it out, without my advice or interference. I’m giving total support, but not the answers that may not be the ones she’d come up with on her own. It’s hard not to step in and offer solutions, but I know in the long run, my friend will figure out what’s best and I’ll be there to celebrate with her.